In recent years, digital marketing has become a fundamental part of the success of any business, whether online or physical. With the advancement of the Internet and the emergence of smart mobile devices, companies have seen in these devices a new way to reach customers around the world. 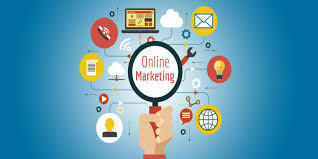 In order to achieve these goals, it is very important to know the trends about the types of digital marketing that are most beneficial. There are many options, but today we will see some important types that we think can be very useful. Check out the list of 5 important types of Digital Marketing below. When we talk about the content, we are referring to that material that you prepare with such care in the hope of getting potential customers to current customers. Many businesses use this type of marketing as a strategy to get a better positioning of their business. It has been proven that generating value content creates a greater relationship between customers and the brand. Through this type of marketing, we can boost the search results, get the public to gradually get closer to your brand and turn your business into a benchmark within the market. To all this, we have to add that it is a powerful tool to increase the web traffic and therefore the number of sales conversion. This is another type of marketing that aims at facilitating potential customers to find our brand. All the actions that are carried out are planned to be carried out at the right time. In this case, the most important thing is to provide useful information that offers something of value in exchange for care. Within the inbound marketing, we can find some techniques like the use of blogs, publish videos in YouTube or SEO strategies among others. It is a strategy whose goal goes beyond making a profit. Its main goal is to obtain a portfolio of loyal customers, who can function as ambassadors of our brand and create a beneficial relationship for both parties. To achieve the above, it is very important to use CRM (Customer Relationship Management) tools with which we can individually manage the relationship established with each of our customers. It can become a very powerful tool as long as it is used correctly. Its main objective is to build loyalty with the customer, reinforcing the brand image. To be effective, it is necessary to have an updated database, where all the users have given us their approval to send them our emails. Forget about buying a database, as it is certain that all those people will not be interested in receiving information about your business, which translates into a negative vision for your business. Make sure to find the customers from your sector. It is always necessary to find customers from the same sector because the conversion rate will be more. The last type of marketing of our list is related to the workers of a company. We have to remember that whenever the first ambassadors of the brand are their own workers, they are the ones who spend much of the day working to get the best for the company. Because of this, it is very important that you establish some kind of strategy that is directed to the members of your team. With this, two objectives are sought: to create a good environment and for employees to speak well of the brand. There are many actions that can be carried out within the corporate marketing. For example, conduct entertainment activities for employees, greater flexibility in dressing, flexibility in discussions, etc. When such kind of activities is performed in the company, you can get most out of your employees. These are the 5 important Digital Marketing types which are very useful to improve our business online and offline. I hope this article will help you to improve your business to the next level of marketing. If you have any queries regarding any of the marketing type, let us know in the below comment section. We will get back to you to solve all your queries as soon as possible. If you are an expert in any of the digital marketing type, share your experiences with our readers. Which marketing type do you use more to improve your business or website marketing?